Formalize your employee termination / deprovisioning process. Make sure compliance and security mandates are met. Implementing this Scope Action gives you the chance to sit with HR and make sure that the same procedures happen, in the same way, EVERY TIME! No more staying late on Friday to pull reports or clean up AD. Simplify with this 1-click option and add customization to make it your own! 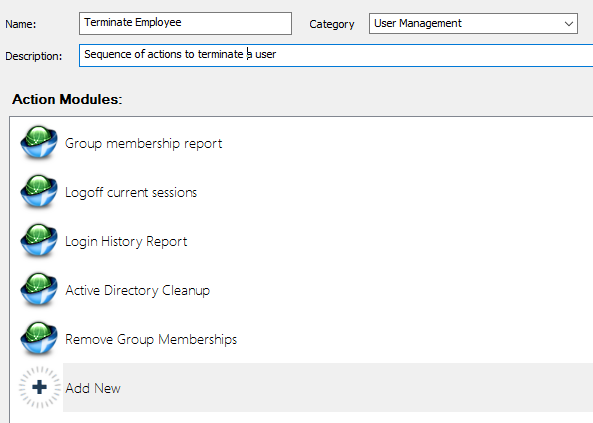 Generate a Group Membership report – A simple report showing you which AD Groups the targeted user(s) are members of. Actions 2 and 4 need to be edited/adjusted for your environment. Add more to this Scope Action as needed. You can optionally move files and folders, export the user mailbox, delete roaming profiles, etc. Read this tutorial for additional ideas. Turn this Scope Action into a custom action – See how!